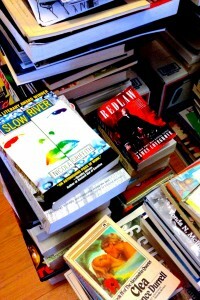 Here's some of the books, stacked in the hallway and waiting to be sorted through. It's a fairly representative sampling. Redlaw was picked up at a con; it's a good thriller reminiscent of Paul Cornell's London Calling. Nicola Griffith's Slow River is a book I hate to part with and I know there's a good chance I might reread it at some point but for now...out it goes. There's some issues of the Magazine of F&SF, and Lawrence Durrell's Clea, which was part of "I will improve myself as a writer" reading. One of the things 2014 is bringing is all sorts of interesting and awesome changes, but part of that is a need to trim down drastically. So I’ve been going through my books getting ready to sell a lot of them. Many are from teen years, college, or grad school. Others are gathered at cons, sometimes with stories attached. Some sparked stories, or were gifts from, or were written by people I respect and admire and sometimes love. Some are signed. Some have notes jotted in them. Some are books that changed my life. So far I’ve winnowed 700 or 800 books from the collection and there’s still a lot left. Not to mention there’s a storage locker holding at least another 1000. Argh. But rather than dump them all at Value Village, I’m taking these last days to sort through them. Because some of these books are old, old friends. So I’m checking them on Amazon (and finding a few worth unexpectedly more, which is nice) and listing all the ones for sale in a spreadsheet, with a few notes and a price. A few I’m putting aside to give to specific people. There’s two boxes laid aside already for my godchildren. After that, time to see if I can get a little filthy lucre for them. I’ll offer to share the spreadsheet with my writing group, students, other friends, and anyone else interested. (Drop a line here if you are.) Lots of fiction, particularly short stories, a lot of Women’s Studies texts, assorted odd bits and interesting historical stuff. The usual round of books about writing. I’ll be blogging about some of the books as I hit them. After this comes a similar pass at all the knick-knackery I have accumulated. Not looking forward to that too much, but there’s also a good feeling, a wind-through-one’s-soul feeling that comes with shedding stuff. This entry was posted in daily life and tagged amazon, books, de-cluttering for writers, getting rid of books, shedding books. Bookmark the permalink.